The lines at San Diego Comic Con can be really, really, really long. So, what do you do while you're standing in line (or, you know, if you're not one of the people there and just have some time on your hands)? You read a gaming magazine! And Irregular Magazine has their latest issue now available. Timing! This is the last post of the day here on TGN. So, what will you do to fill the void between now and when I schedule up the first one for tomorrow? Well, I might suggest a gaming magazine. In particular, Issue 4 of Irregular Magazine is now available. It's just full of all sorts of gaming goodies to tide you over. As I mentioned earlier, I've seen a lot of you are traveling to Chicago for Adepticon. Many of the updates are coming from people sitting in airports, waiting for their flights. Well, if that's where you're at (or are anywhere that you can stop and read a digital magazine, really), you can fill up that wait with the 3rd issue of Irregular Magazine, which is available now. Looking at the calendar, it's still summer (going by Northern hemisphere here, obviously). But, to me and a lot of other people I know, they're already ready for autumn (hell, my Kroger has Halloween decorations out). So, it seems like it'd be a great time to come out with the Summer/Autumn issue of your magazine, if you were to release them in such a fashion. Irregular Magazine does that, and hey, their latest issue is available. Now we've got ourselves elbow-deep into Tuesday. I know a lot of people that will be headed to Boston this weekend for PAX East. Well, along the way, you could listen to some gaming podcasts. Good thing we've got them all together in our Podcast Roundup. Today we have: Ice Cream For Everyone Ep 21: Tom Williams, Blue Peg, Pink Peg Episode 71- The Prodigals Club and Wisdom Check 3, Meeples & Miniatures – Episode 169 – Horizon Wars, Epic Gaming Night Podcast Ep 51 Player or Hobbyist, Tales of Malifaux 28, The Hub Systems Episode 18 - Adepticon & Polyversal, From the Hip talks up the inaugural Connecticut Festival of Indie Games, Irregular Magazine Salute 2016 Videos, and News of the North – 2016-04-19. Irregular Magazine is back from hiatus and has posted the first issue of Volume 2 of their magazine. In this first issue back they take a look at building an army on the cheap, some sci-fi short story, how to make a scratch-built Star Destroyer for X-Wing, and some advice on scratch-building some alien terrain. All that and more. Let's welcome them back and download the magazine (it's free, by the way). Irregular Magazine has posted up Issue 14 online for your downloading and reading pleasure. 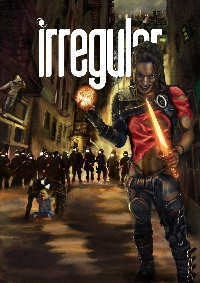 Irregular Magazine now has issue 13 available to download for your reading pleasure. First of all, we’d like to start wih an apology to all of our readers and contributors. We were not able to publish Irregular Magazine in Summer 2012, which we deeply regret. We believe we’ve got through the problems that made this impossible and are now back on track with regular publications! Irregular Magazine has a new web address. Go check 'em out in their new spot. Just to let everyone know Irregular Magazine has moved hosts and now has a new address. If anyone has had difficulty in finding the latest issue, that's the reason. All back issues can be now be found at the new address along with current and all future copies of the magazine. Also we are currently looking for contributors to write and illustrate for the magazine. 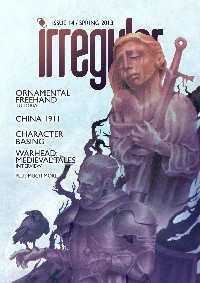 Irregular Magazine now has Issue 12 on their site, free to download. Check it out. We have another great issue this month, packed with excellent articles and tutorials. We have a great retrospective looking at a Empire, a computer game from the 70s that is still being played today on the internet. We also have another peek into our developing world for the Traveller RPG, this time some NPCs for players to encounter, there is a review of Leeds Armouries and a look at how the Goths played a part in the downfall of Rome. 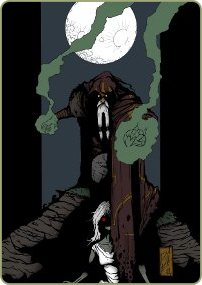 We have an article looking at the new D8 RPG Sins, which began life at Patriot Games, written by the lead developer of the project. We also have another behind the scenes article, this time looking at the Abney Park’s Airship Pirates RPG, focusing on the artwork for the game with an interview of some of the artists involved. This issue our theme is Pulp. 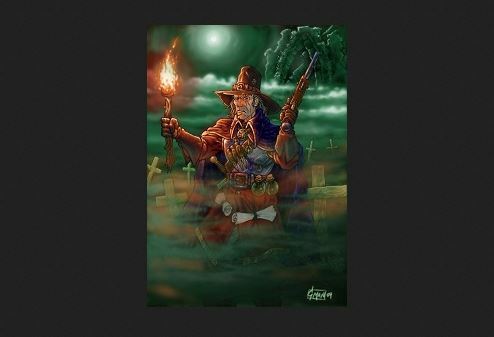 Cover artist David Heath has created a superb cover which includes many of our favourite Pulp themes. As usual we have reviews, tutorials, articles and a two short stories plus another episode of our comic Tuk Tuk. Time to get reading – go on, download your copy now.